Andrew has recently rekindled his love affair with brussels sprouts which were never my favourite. Not because I didn’t like them necessarily, just because we never ate them growing up. And when one of my aunts did serve them at the occasional family Christmas dinner or Thanksgiving feast, they usually arrived at the table soggy, under-seasoned, and looking like sad, flaccid, little outcasts that everyone avoided. Well, times have changed and – in our house – we’re embracing the new era of the brussels sprout to give it its due. Put oven rack in upper third of oven and preheat oven to 450°F. Toss Brussels sprouts with oil, garlic, salt, and pepper, then spread out in 1 layer in 2 large shallow baking pans (17 by 12 inches). Roast, stirring occasionally and switching position of pans halfway through roasting, until tender and browned, 25 to 35 minutes. Meanwhile, heat oil in a 10-inch heavy skillet over moderate heat. Sauté shallots, stirring occasionally, until golden brown. Add mushrooms, stirring occasionally, until golden brown and tender, about 7 minutes. Add wine, thyme, salt, and pepper and boil, uncovered, stirring occasionally, until liquid is reduced to a glaze, about 2 minutes. Transfer to a serving dish and stir in brussels sprouts. Serve with pride and tasty anticipation. 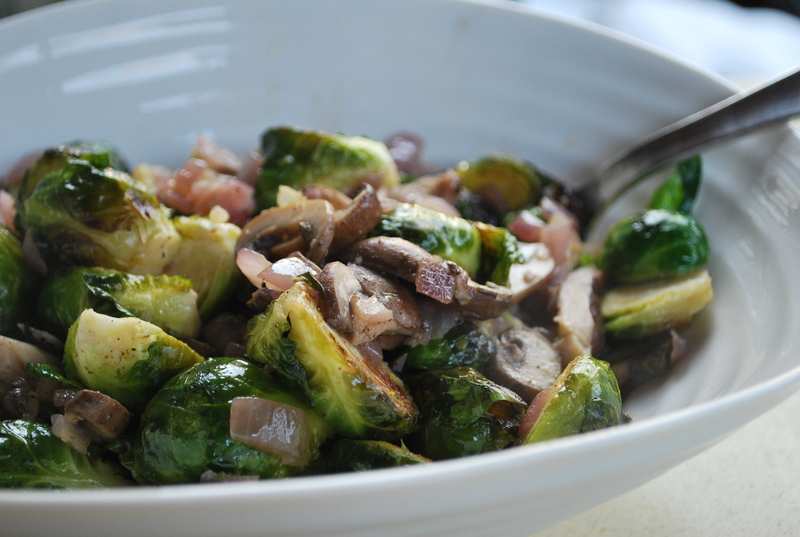 I’ve just recently jumped on the brussel sprout bandwagon and I love them….when done right. Yours looks incredible! Lots of great flavours!